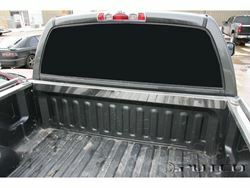 The Putco Front Bed Protector will protect the top edge of your truck bed closest to the truck cab. This stainless steel piece is custom fit for a seamless look and is deburred for no sharp edges. Installing the piece is easy, just peel and stick with 3M adhesive tape. They are backed by Putco's NeveRust Stainless Steel warranty.